Turn your images into Resene colour palettes quickly and easily with the new online Resene Palette Generator. 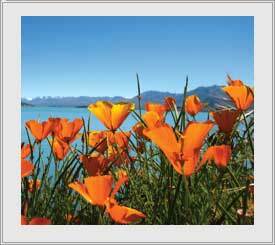 Simply select and upload your image and then click the 'Generate' button. 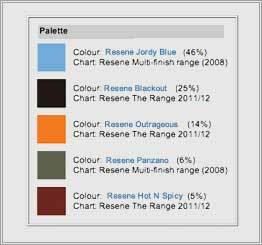 The Resene Palette Generator will create a Resene colour palette based on the most common colours that occur in the image and tell you what proportion (%) of the palette they are to help give you an idea of the colour balance. Once done you can click on the colours for more information, download swatches and save or email them or share your colour palette to Facebook. To generate your own colour palette, enter the web address (URL) of an image from a website and click on 'Select' or upload your own image from your computer, then click on the 'Upload' button. Once the image is uploaded, click on the 'Generate' button. Remember electronic colours can look different on different computers and screens. The Resene Colour Palette Generator can suggest similar colours to your picture. If you need a precise colour match, visit your local Resene ColorShop or reseller and ask our staff about our colour match paint service. Always view actual paint or product samples before making your final choice.